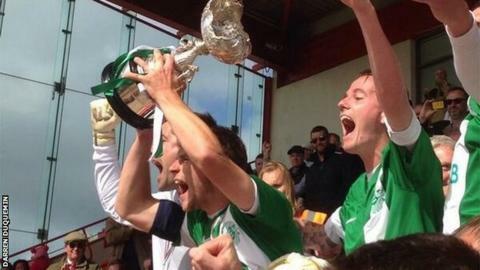 Guernsey won their third successive Muratti Vase as they defeated Jersey 4-1 at Springfield. Jersey got off to the worst possible start as Ross Allen converted a sixth-minute penalty before Jacques Isabelle doubled the lead 10 minutes later. Allen made it three with a powerful free kick from 20 yards out three minutes after half-time. Cav Miley pulled one back for Jersey before Matt Loaring scored Guernsey's fourth goal. The difference between the two sides is the amount and level of football the two sides play on a regular basis. They've developed a higher level of football since they've been playing in the higher leagues. It was Guernsey's 45th Muratti win over Jersey, whose manager Craig Culkin revealed before kick off that he was quitting after a team selection dispute. Allen, who had been the subject of a number of tough early challenges from the Jersey defence, put his spot-kick past Jimmy Styles after a handball in the box by Luke Watson from a free-kick. Craig Russell hit the side netting from a corner for Jersey soon after, but it was not long before the visitors got their second as Isabelle converted following some impressive build-up play. Seven minutes before the break Dominic Heaume missed a chance to make it three after Ross Allen beat two Jersey defenders and put a tantalising ball across the face of goal. However, Allen got his second and Guernsey's third as the Sarnian's standout player expertly converted a free-kick after Kieron Mahon was fouled just outside the box. Jersey started to threaten, as first Miley reduced the deficit when Chris Tardif fumbled his effort over the line in the 55th minute. Tardif made amends with a good save from Jersey skipper Jack Boyle after former island captain Chris Andrews set up the ex-Airdrieonians midfielder. But Guernsey killed off their hosts' hopes of a comeback as Allen turned provider as his ball in found Matt Loaring who steered it round Styles to seal the win. "I think it was fully deserved. They came out and expressed themselves and played some brave attacking football. "I don't think the score-line flattered us. We could have scored a few more goals." "I'm really proud of the players, Guernsey were a cut above and a class above. "Today was about Guernsey, let's give them some credit because they were class."